What Dangerous Wild Animals (DWA) live in your area? Lions, wolves and deadly venomous snakes are among thousands of dangerous animals being kept on private properties across the UK, figures have revealed. Big cats including 13 tigers, two lions, eight leopards, seven cheetahs and nine pumas are prowling behind the fences of addresses up and down the land, an investigation by the Press Association has found. 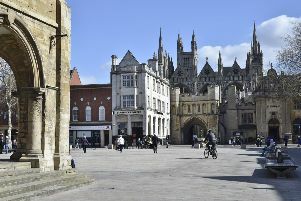 Peterborough is home to one Asian leopard cat and a maximum of 30 hybrid Bengal cats while Huntingdonshire is home to six crocodiles, one ostrich and three Savannah cats. The data was obtained from freedom of information (FOI) requests sent to every council in the UK, of which 363 replied. In Northern Ireland, the Environment Agency provided the figures for the whole country. Dangerous wild animals (DWA) licences are granted by councils to allow people to keep undomesticated animals as pets, providing they have the requisite safety measures at their home and pay a small fee..
:: Bolsover District Council - One sidewinder, seven rattlesnakes, six cobras, one copperhead, one Taylor’s cantil, two vipers. :: East Riding of Yorkshire Council - Eight lemurs, eight short-clawed otters, up to 11 capuchin monkeys or ring-tailed lemurs, three Savannah cats. :: Kirklees Council - One Asian leopard cat and five hybrid Asian leopard cats. :: Monmouthshire County Council - A maximum of eight bison, a maximum of five vipers, cobras, helodermas and crocodilians, a maximum of 16 ostriches.